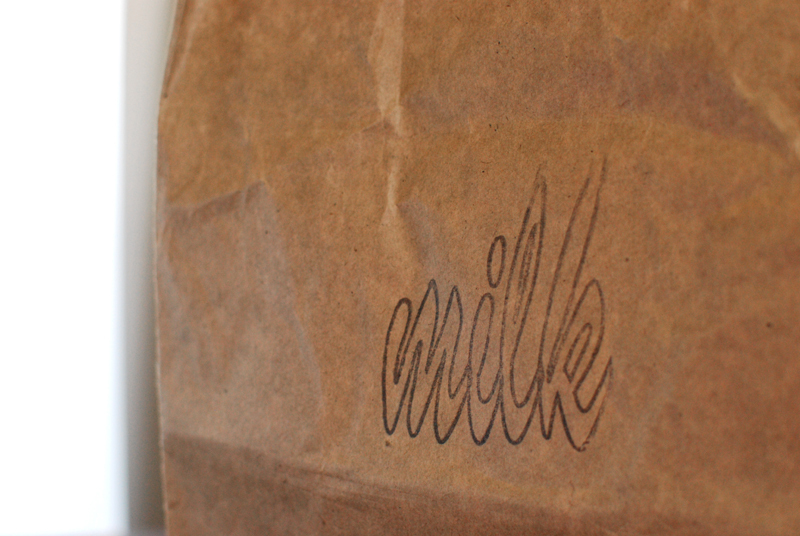 On our recent trip to New York City, we stopped in at Momofuku Milk Bar. 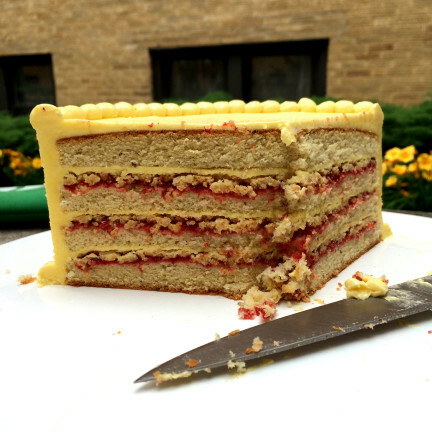 Christina Tosi, head Pastry Chef of David Chang’s Momofuku empire, has lately become a darling of the food world. With my training in Baking and Pastry Arts, I mostly wanted to see what all the fuss was about. I’ve already said my piece on the black sesame croissant we got (the short version: it’s awesome), but we also picked up the five cookie flavors they offered that day: Compost(TM)(srsly), chocolate-chocolate, cornflake-marshmallow, blueberry & cream, and corn. As you can see, some of them didn’t last until the photo shoot. Overall, these are good cookies. 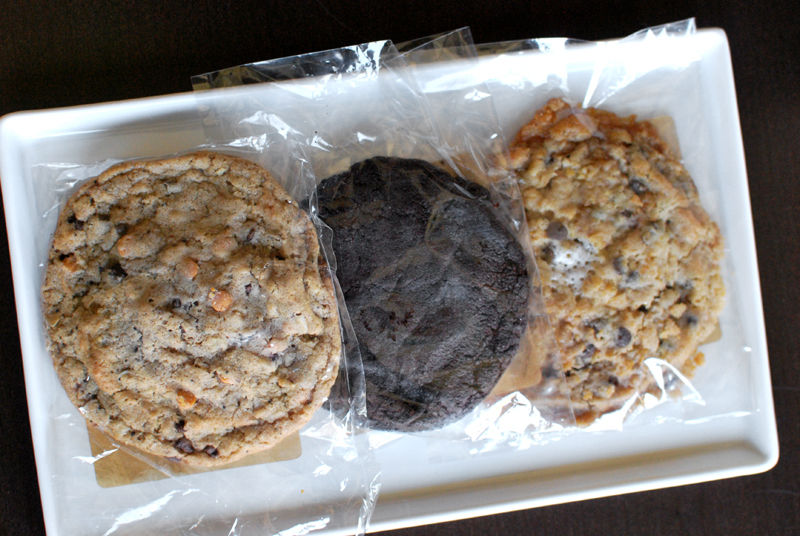 They have many qualities of acceptable bakery cookies: big as a small plate, sweet, interesting flavor bits, texture somewhere between chewy and soft. The chocolate-chocolate was the best of these three, with a sophisticated flavor redolent of Oreo, which I assume must be due to black cocoa. But if I’m honest, I didn’t get anything terribly special from the lauded Compost(TM) and blueberry & cream flavors. Yes, the Compost(TM) has interesting salty bits, and the blueberry has… blueberries; but they’re not really enough for me to travel across town for, let alone get on a plane to NYC. Maybe the problem is with me, though. Despite my scholastic specialization, I don’t have much of a sweet tooth. I’d much rather eat something salty and savory over a cookie any day. So for a cookie to impress me, it has to be something pretty darn special. It has to make me sit up, narrow my eyes, tilt my head ever so slightly, and maybe curse gently. 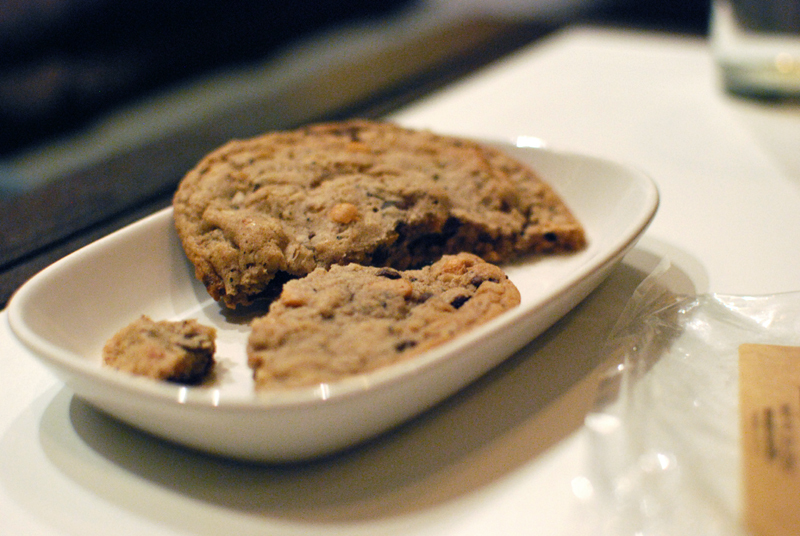 It pretty much has to be Plato’s Ideal Cookie. This, Gentle Reader, is that cookie. Well, it’s where that cookie used to be, anyway. 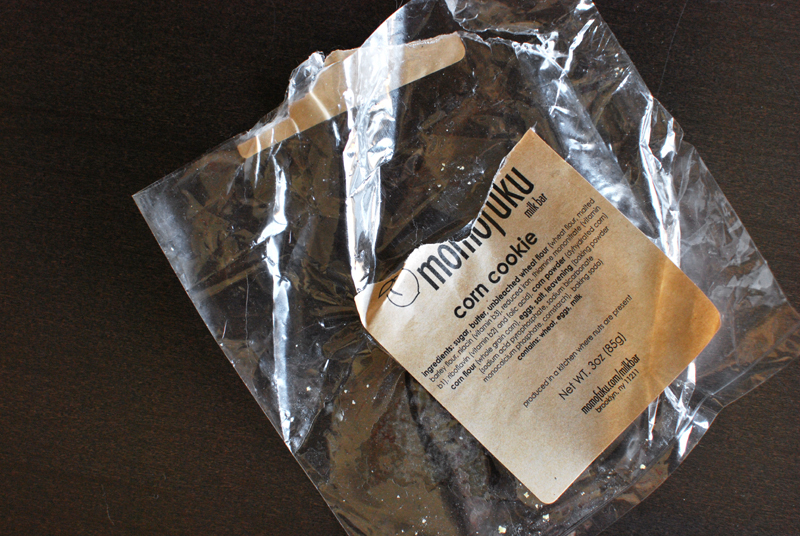 This is where the corn cookie used to be, the cookie that made me wish I had been responsible for its existence. 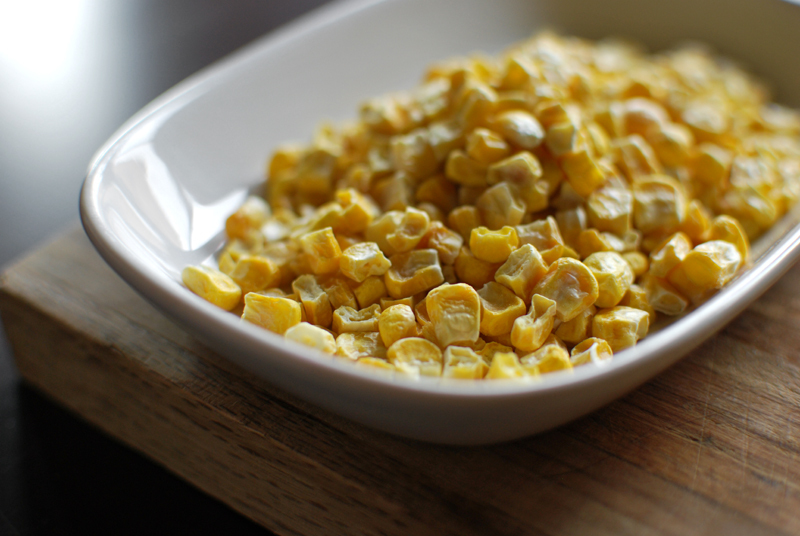 How could anything that is not-corn taste so much like corn? I’ve never tried to reverse-engineer a baked good before, but this cookie demanded an attempt. I had two clues at my disposal: one, the ingredients list (listed by weight, remember), and two, the knowledge that Chef Tosi uses high-quality ingredients with simple techniques. She was likely going to use whatever was easily at her disposal, and not futz with things too much. There would be no unnecessary complication, like, say, steeping churned-in-house butter with late-July corn cobs to infuse every possible mote with ultimate corn flavor. The one “mystery” ingredient, if it can be called that, was something listed as “corn powder (dyhydrated corn)” [sic]. I assumed that was a typo, and not corn with two types of water. And as chance would have it, while procuring cinnamon from the amazing spice store that I am lucky to live near, I noticed a register-side basket of nothing less than freeze-dried corn. Close enough. Back home, my research determined that this cookie dough was most likely a variant of the basic chocolate chip cookie, sans chips, of course. I listed the ingredients and amounts from four trusted recipes, and developed a recipe based on those, swapping some of the flour for finely-ground corn meal and freeze-dried corn. 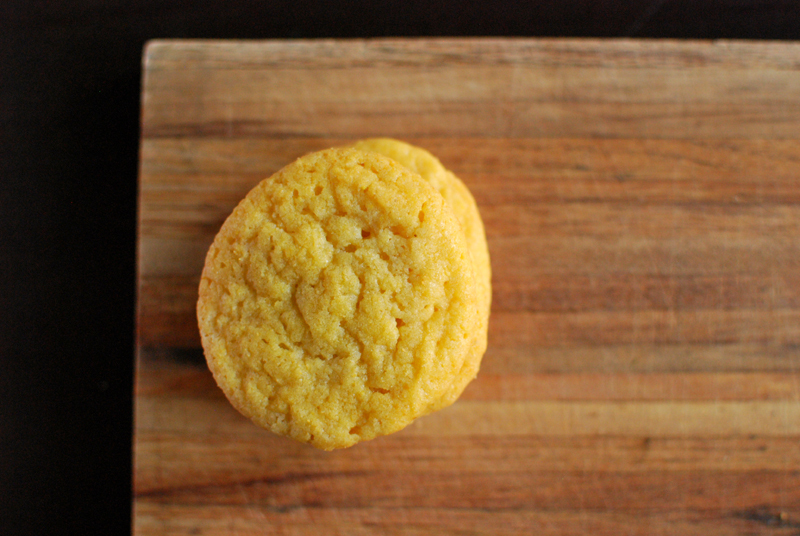 The dough came together beautifully, to my glee, and baked into a soft and ultra-yellow cookie that looked surprisingly similar to the real deal. And the taste? I couldn’t very well do a side by side comparison, but it wasn’t far off from what I remembered: slightly under-sweet, buttery, and with a truckload of corn flavor. It’s possible to tweak the amounts slightly and maybe achieve a more accurate recipe, but I’m pretty thrilled with what resulted. And unless someone is willing to sponsor me, I don’t really want to pay for the shipping involved in acquiring a new batch of “control” corn cookies for further analysis. …I’m revising the recipe to include a mandatory fridge rest for the dough. I don’t know that all of Chef Tosi’s cookie recipes would necessarily include a rest, but one apparently does. I know it works miracles on most cookie dough, and I’ve always done it for this recipe with great success. And it’s my blog. So there. As with most cookie dough, this one may be frozen or refrigerated, and may actually give a better result if left to rest overnight in the refrigerator. 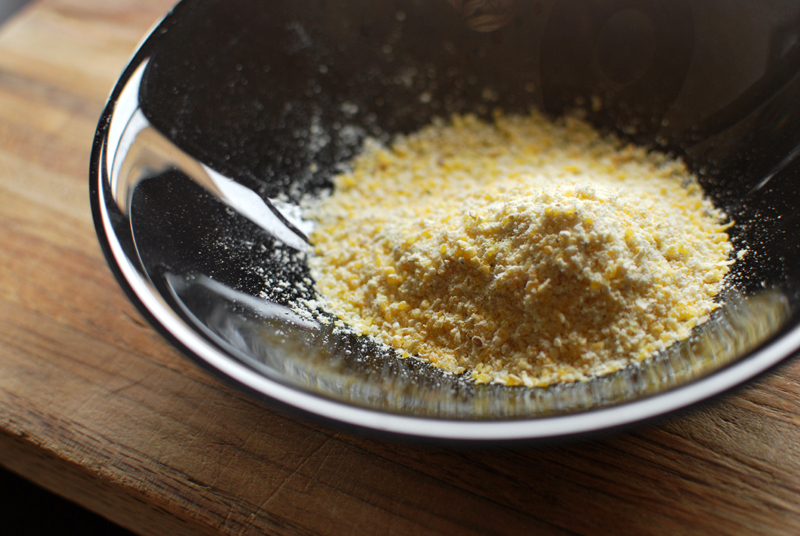 If you can’t get your hands on corn flour, just use a good-quality cornmeal (preferably stone-ground, but whatever) and grind it to a very fine powder in a spice grinder. 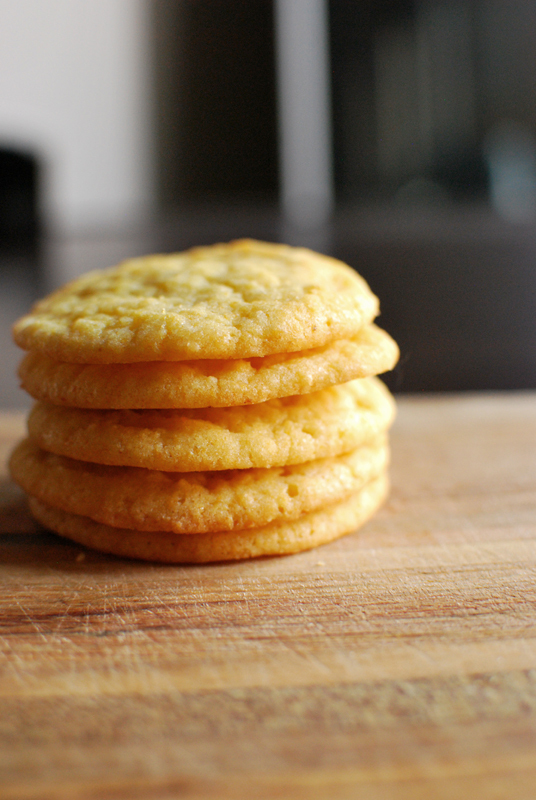 Don’t be tempted to use unadulterated cornmeal; it will give your cookies a gritty texture. No pun intended. While I found the freeze-dried corn at my amazing local spice shop (they ship! ), I know that natural-food groceries (like Whole Foods) often carry a brand of dehydrated vegetables that makes dried corn. They might have it in stock, or be able to order it for you. Also, I specify a European-style butter, which has a higher fat percentage than American butter, making for a softer cookie. I don’t know what sort of butter Milk Bar uses, but I know their dairy is high-quality and sourced from a local farm, so I figured I’d use the good stuff. The recipe should work just fine with whatever butter you have, though. Yes, I’m listing everything by weight. Grams, to boot. I don’t know how to translate “120 grams of freeze-dried corn” into cups; I’m sorry. But if you bake regularly, and you don’t have a scale, you should really, really, really invest the $15-20. 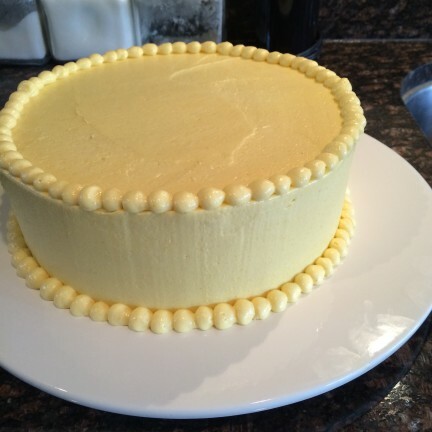 It’s much more precise, and your baked goods will turn out more consistently. 1. 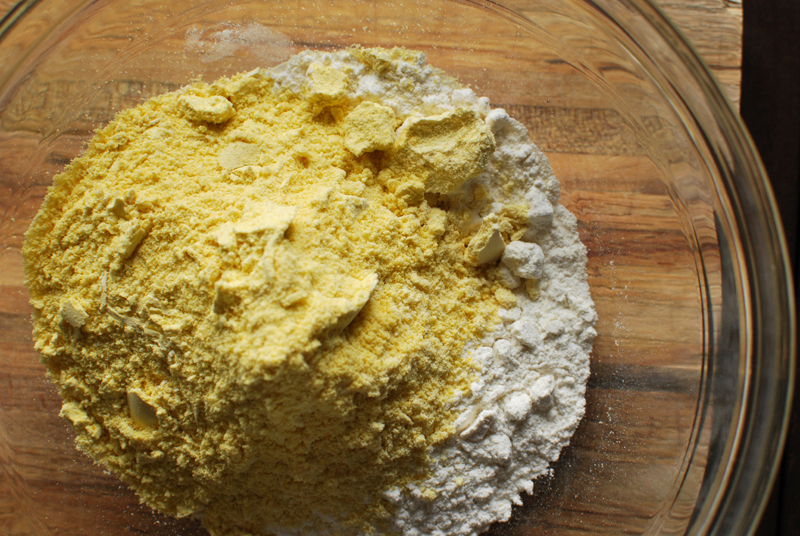 Preheat the oven to 350º F. Whisk together the all-purpose flour, ground up freeze-dried corn, corn flour, salt, baking powder, and baking soda; set it aside. 2. In the bowl of a stand mixer (or by hand, if you’re into that), cream together the sugar and butter until just combined, scraping the bowl as needed. You should only need to mix for about a minute, maybe less. Please do not beat the living daylights out of it; your cookies will spread too much if you do. 3. Add the eggs one at a time, beating to incorporate after each addition. Add the dry ingredients and mix just until a soft dough forms. Gently scrape the dough into an airtight container (a plastic container, zip-top bag, or just wrap the lot in plastic wrap); no need to shape pretty logs, though that’s certainly an option if you like. Refrigerate for at least 1 hour, and up to 2-3 days. Alternatively, portion the dough out into individual cookie lumps, place on a single sheet pan (it’s okay if they touch), wrap in plastic wrap, and freeze until solid before storing in a gallon freezer zip-top bag. 4. If refrigerated, leave dough at room temperature for 30-60 minutes before proceeding. 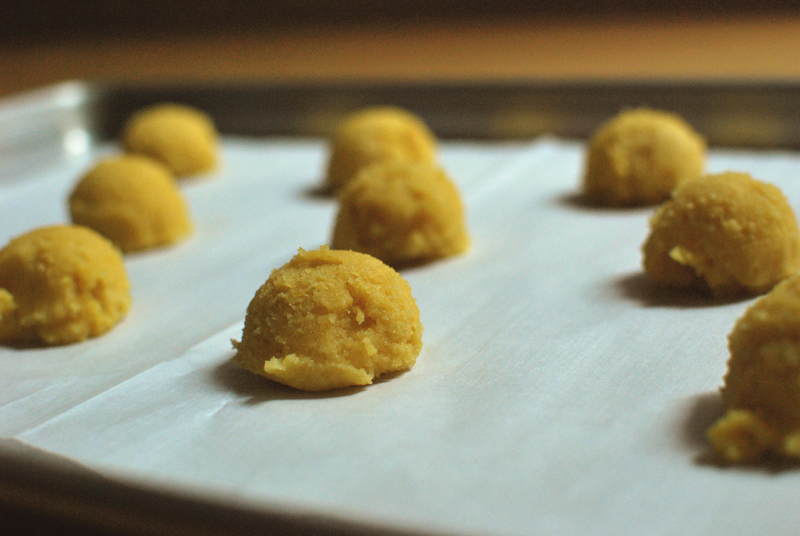 If frozen in portioned out lumps, proceed without thawing, but add a couple of extra minutes to the baking time. Scoop heaping tablespoons of dough onto parchment-lined or ungreased sheet pans, leaving about 2 inches between each. Bake at 350º F for 10-12 minutes, or until the undersides and the occasional outside edge turn golden brown. Don’t let the tops brown; the cookies should remain bright yellow with no (or very little) browning. Let cookies cool briefly on the pans before transferring to racks to cool thoroughly.